Keep your finger on the pulse of global renewable energy project and contract awards. Access key tactical information across the offshore wind, onshore wind, marine energy and storage sectors with trusted, real‑time updates guaranteeing to add value to your business and helping you stay ahead of the competition. Whether choosing a target market or conducting a competitive benchmarking exercise our cutting-edge Project Intelligence Hub and tailored reports, offers members unparalleled access to key market data from our trusted team of expert analysts. Contracts - Contract awards on a project, for a specific component, by awarding or awarded company. 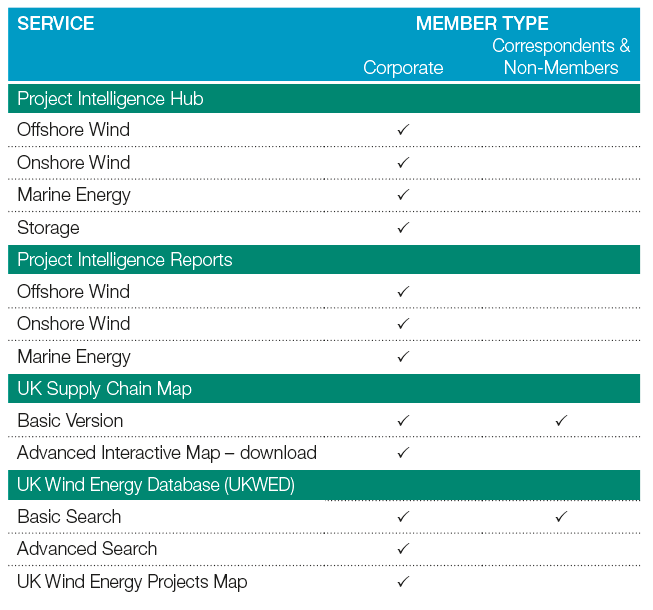 Regular Offshore and Onshore Wind and Marine Project Intelligence reports and special reports provide a high-level snapshot of the UK, European and global markets. Available only to RenewableUK corporate level members. Dynamic mapping pin‑points the locations of organisations active in the wind and marine renewables industry, etc. Member only access to enhanced version of map. Key data on onshore and offshore wind projects in the UK. Member only access to projects maps and download features. Intelligence is gathered from our network of members, government publications, regulators, planning authorities, publicly available company information, financial markets and established media sources. RenewableUK is the leading authority on offshore wind, onshore wind, marine energy, systems and storage. As the industry’s leading trade association, we have earned a reputation for excellence that spans 40 years and are extremely well connected with all major industry stakeholders. Our expert team of analysts have developed our robust database and forecasting models which are continuously peer reviewed and tested with our members to ensure the highest quality information. Get ahead of your competitors and access this invaluable market information by becoming a RenewableUK corporate level member today! For more information on our project intelligence data and services please contact Bahzad Ayoub. For information on becoming a RenewableUK corporate member please contact Jeremy Sullivan.